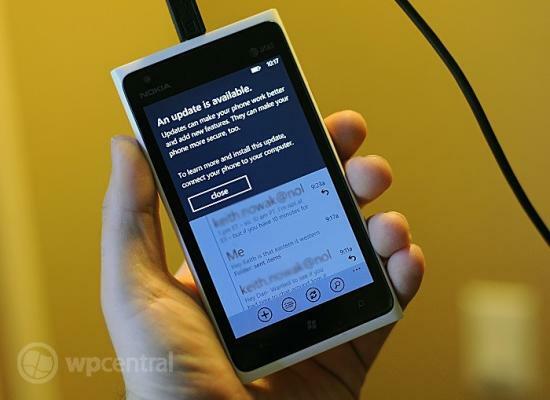 We gave you a sneak peak a few days ago of the AT&T-Nokia update for the Lumia 900 which features and OS update (‘Tango’ build 8779) and new firmware (build 12223) and now that update is live for all to download (or should be very soon). Starting today, plugging your AT&T branded Lumia 900 into Zune Desktop should prompt you for an OS update, which will then walk you through the short process. A hard-reset is not required and users will not lose any information. “The most visible item that this update delivers is one of the newest features of the Windows Phone platform: the intuitive “flip-to-silence” function when receiving an incoming call. We have reports from users right now that the update is live and they are getting it. That only means one thing: stop reading and go get your update. Users should also notice some new wallpapers (the "nature series"), more MMS options including multiple image support, voice notes and sharing of custom ringtones and other minor fixes. Windows Phone Central earlier reviewed the new camera fixes and improvements, which users can read here for more information. Our review concluded that the Lumia 900 camera has drastically improved with this latest firmware from Nokia, making the phone a very attractive option for users. For those wanting to "force" the update, you can try the Wi-Fi disconnect method detailed here. This method will only work when AT&T release the update on their servers and it propagates---stand by.